It is HOT and HUMID today. It will be HOT and HUMID for the next week... So, the pool awaits, our daughter and granddaughters will be here shortly - I will take off the rest of the day . I hope this is OK with everyone. Enjoy your weekend! P.S. : Our shop is about 160 feet straight behind the large oak just to the right of the end of the deck, and beyond the little wooden shed just visible between the oak tree and the deck. Believe it or not guys we have that kind of heat up here too but only about 25% humidity. THAT must be highly unusual for you guys! The weather pattern you are getting is finding its way into the central plains, and NW Missouri is right in the middle of it. Tonight and tomorrow we expect scattered thunderstorms and maybe some rain, but temps will be in the mid-90s. No relief in sight. No this is a normal summer day here Al. An hours drive from here is the driest spot in Canada. My sundeck thermometer was 103F today. I had NO idea you had such weather, Rick! I used to go to Banff every two years, to attend a conference on fluid flow. That conference alternated between Banff and Cannes - it was GREAT, to say the least. Stay cool, and enjoy the rest of the summer. Weatherman just said we will be close to 100°F most of this week. If I weren't so jealous, I'd almost hate you. You can't ask for more than that...a pool, shop in the back yard, and most importantly, family by your side enjoying it all with you! LOL, Chris! Thanks for the nice words. Tell you what - next time you are in this neck of the woods, please stop by and refresh. BUT, it must be between April and late September, as we close down the pool for the winter, and use one of those covers that will hold elephants and cars. The cover keeps leaves and raccoons and other such animals out of the pool during the Fall and Winter months. I noticed that cover on the pool...how do you like it? Does it stretch tightly over the pool so that water doesn't stand on it? I'm looking for a better way without having to spend a fortune for a cover. We actually have two covers. The one in the photo is the thermal cover - it floats on the surface of the water, is insulated, and has a reflective surface on the side facing the water. I unroll this one in the evenings, when we expect the night temps will drop off significantly. It REALLY helps to keep the temperature warm, without too much drop! But, since it has not been cooling much below the high 70s, I have not even bothered rolling out in the last several days. I use a manual crank to roll it back up under the diving board in the mornings, when I measure the water chemistry. The cover we place on the pool when closed for the Fall and Winter is a mesh, which allows water to fall through into the pool itself, so it does not accumulate at all. And NO pumping at all. This cover is anchored around the pool with a bunch of bolts; these bolts disappear into the concrete pool deck simply by screwing them down down all the way until they are flush with the deck surface. You don't even know they are there, unless you really look. Snow WILL accumulate on this pool cover. This past winter we had about two feet of snow on it, but it held really well! The cover bowed and stretched and moaned and groaned just like it is supposed to do. THAT makes me believe that it WILL hold a car on it. I just have not had the nerve to put my truck on it . In the Spring, when we remove this cover and put on the thermal cover, I simply let the mesh cover dry out in the yard after a good hose-down, fold it up, and store it in the garage above my truck on a platform I crank to almost ceiling height - this platform is available commercially. It works great! 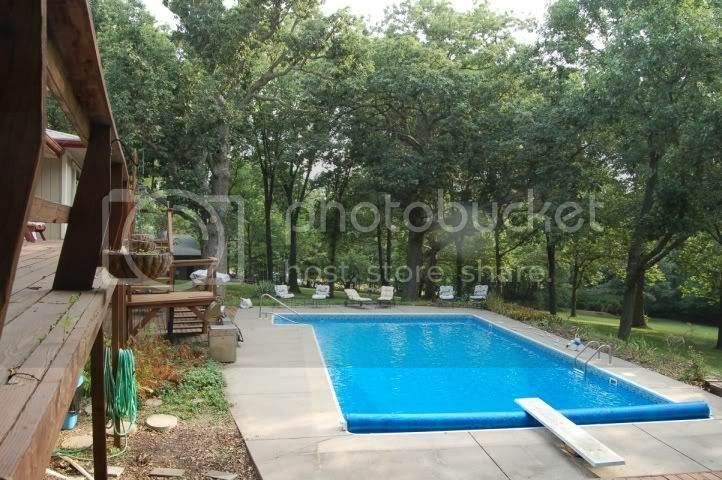 For this 20' x 40' pool the cover runs around $1,500 - I think that is what I paid for it about 3 years ago, Dan. But it IS worth every penny, as it eliminates the water accumulation on it. I know what you mean about water temps not dropping at night lately--the night time air temp has been 80+ for the last several nights. Our water temp has been around 90 for the last week or so, almost too hot to enjoy. $1500 isn't too bad for the safety cover. Our local installer/retailer wanted about $3500. One question though...we were told to drain the water level to just under the skimmer for the winter. If rain runs through the mesh, do you have any freezing problems? I believe you probably have a little bit colder winters than we do here Do you just blow the lines out and not drain the pool any? DanEpps wrote: ...we were told to drain the water level to just under the skimmer for the winter. If rain runs through the mesh, do you have any freezing problems? I believe you probably have a little bit colder winters than we do here Do you just blow the lines out and not drain the pool any? That is right - we drain to just below the skimmers, and add antifreeze to the lines going to the skimmers, which we then send to waste in the Spring. We know when the antifreeze is all gone, as the color change is drastic. We have never had any freezing problems since we have been in this house (4-1/2 years). The way pools are built around here probably compensates a whole lot: Walls are concrete with galvanized panels. No tiles are used, unless the pool is indoors. Instead, rare earths (I think that is what they use) are used as a base for the pool floor, which can moves around quite a bit, so that even if it freezes it is OK. As far as I know, the pools all have vinyl liners about 28 mils think, and that moves a little as well. I believe we have never had any freezing in the water that remains in the pool, as I monitor through the winter months as best I can, to make sure the water level does not drop. IF it drops, it means that the liner could be a candidate for replacement due to shrinkage of the vinyl with no water load - it is about $3,500 a pop for a pool this size (32,000-35,000 gallons). It is the water mass that keeps the liner in place. Okay, if you drain down to the skimmer and the mesh cover lets rain through, does the level rise back over the skimmer in the winter? We have never had THAT much rain during the winter months, Dan. I don't think is a worry around here. I believe that convection takes care of keeping the water from freezing. as the warmer water will always rise and the cooler water will go lower. If the water level rises, and we get a deep freeze, THEN we would be in trouble unless we throw in a sump pump. I will ask around and see if anyone remembers such an extreme condition. Amazing! Our water temperature is up to only 85°F. It might hit in the high 80s to low 90s, but never higher than that. We have considered getting a heater, to allow us to extend the use of the pool by opening it about one month earlier. But at around $4,000 it may not even be a starter. THAT is one GORGEOUS setting, Dan!!! I love the gazebo - the entire area has such a nice feeling!!! Is that a Polaris pool cleaner I see in the far-right corner of the pool? I use mine at least once a day for about 30-40 minutes, which removes most of the cleaning chores for me. I basically just monitor the water chemistry, and add 3-inch chlorine tablets to the automatic chlorinator as needed, plug in Howie the Polaris, and let it rip. That is actually a flower pot you see. We just have a cheapie Barracuda cleaner that we leave in at night. We usually open the pool in mid-April and close it in mid to late October. Our rainy season starts in November and lasts until March. We average about 60\" per year and half comes during those months. I'm just unsure what would happen when the water gets into the skimmer during the winter. Of course, we haven't had a \"hard freeze\" in 50 years so it may not be a concern.